In Cub Scouts, third graders are working on their Bear Badge. This requires completing 12 achievements in the categories of God, Country, Family, and Self. The Cubmaster read the following as one of the Assistant Cubmasters painted Nicholas' face with blue and gold face paint. 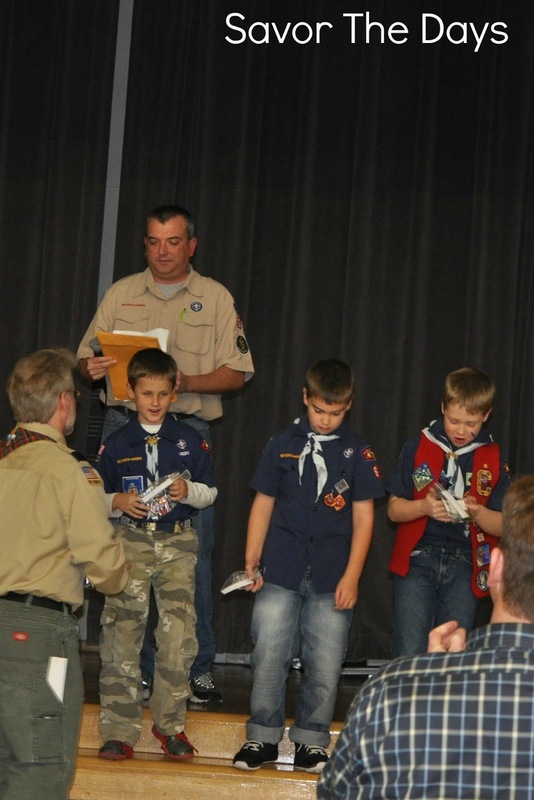 "Nicholas, tonight we recognize that you have taken your next step along the Cub Scout Trail. "You have completed the achievements required to ear the Bear badge. The Bear is respected by all other animals because of its size, its loyalty to its family, and its ability to hunt and fish. In The Jungle Book, the story from which the names of the Cub Scout badges come, it is the bear Baloo who teaches the man child Mowgli the Law of the Jungle. "In earning this badge, you have traveled the way of the Bear, sharing activities with your family and demonstrating useful skills in life. You also have followed the Cub Scout Pledge, learning about your faith and your duty to God and learning about our country and its traditions. "Tonight we mark you with the Cub Scout colors of Blue and Gold. "Blue represents truth and the loyalty for which all Bears are known - loyalty to God, family, country, friends, and, most importantly, loyalty to your beliefs and convictions. "Gold represents good cheer and happiness. It's easy to be happy on a special night like tonight. But remember that a Cub Scout always looks on the bright side of things, rather than the gloomy side. Remember to spread your good cheer by bringing happiness and a bright outlook to those around you. "I now present your Bear badge to your Akelas (that means parents) and ask that they present them to you. Later his whole den was called up to get their patches and pins from the last month. To celebrate the new Bear, we took the kids to Tutti Frutti for some frozen yogurt. The kids love this place because they can fix their own yogurt cups and mix and match from lots of different flavors. Then they can add toppings like fruit, candy, sprinkles, and syrups until it is a mound of sweet sticky goodness. What a fun night! We are so proud of Nicholas and his how much he has learned and achieved through scouting. I am a bear den leader in Northern KY, looking for blue and gold banquet ideas on ways to present the badge to my den. Thank you for such a great post! We are going to do facepaint.